Joey and I sat side by side, staring at the screen in front of us. Or at least, I was staring at it. Joey was staring anywhere else. “What do you want?” I asked again. Joey gave me one of his award-winning smiles that typically works to melt my heart. He looked at the book hopefully, and then back at me. This is how he usually lets me know what he wants to read. Instead of melting, my heart broke. I felt like Cruella Deville, utterly ignoring the pain of the small boy in front of me. “What do you want?” I asked again, gesturing to the screen and pretending I did not understand his attempt to ask for the book. Joey’s smile faded. He looked at the screen and then back to me, and then to the book he wanted me to read. He pushed his head as close to the book as he could, and started to cry. He looked at me, and then the book, waiting. I have a three year old at home myself. And this, was three year old behavior. He clearly was capable of using the AAC device if he could tell me “Feel. Mad.” And yet, he was refusing to use it to request the book. And why should he? Poor guy. He’s spent the last year using his method of eye contact, smile, gesture, smile, eye contact to tell people what he wants. He’s quite good at the method, and for the most part it works very well for him. Why would he change? Then here I come, someone who usually brings him new books and toys, and I am demanding that he push some silly button in order to say he wants a book. Which, I obviously KNOW he wants already. Of course he is mad. He’s as mad as my own daughter is when she asks for more milk and I refuse to give it to her until she says please. In fact, that happened just the night before, and I am pretty sure she won that round. She went to bed without another glass of milk. Maybe going head to head with a two year old is not the best way to achieve this goal. I look back at Joey, who has a tear rolling down his face. The trouble with using the eye-gaze system, is that most of us who have used assistive technology devices in the past, have been able to use hand-over-hand prompting to show a child how to use it. We play their favorite song, stop the song, then take the child’s hand and have them push the “go” button. Then we turn the song on again. After a few times the child associates the ‘go’ button with the music, and he can do it by himself. Except this is eye gaze, and we can’t quite do eye-over-eye with this system. 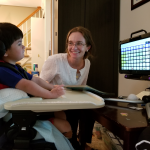 Using the eye gaze system has been a learning curve for many of us, although thankfully there have been many people out there willing to collaborate, connect, and train us in how to use the system. OH! Mom went to the bathroom! Sure enough, she had. In the beginning, he was also remarkable at waiting until I was standing up to go before he used it. We could go through almost an entire session of me prompting and prodding, and then minute I stood up to leave he would look at the machine and say “Stop. Come. Read. More. Read. Come. Read.” Hmmmm… my friend. I think you may be holding out on me. Oh yes, wait, you are three. So Joey is not a big fan of prompted communication, but since I live with a three year old myself, I can attest that this is pretty age appropriate behavior. In fact, I’m an adult and I don’t like being told what to say and when to say it. I have a feeling Joey’s determination to not respond to a prompt is part of his strengths. Not that it makes any of our lives much easier. We were reading Pete the Cat the other day, and every time I asked Joey what color shoe Pete stepped in he quickly selected the wrong color. I know that Joey knows his colors, and he knows that Pete stepped in a pile of red strawberries. Joey has read this book too many times to count. “NO!” I said, “Pete did not step in PURPLE!” (I hit the NO and PURPLE button on the AAC device as I talked). “YES” Joey replied through his talky. “YES PURPLE,” and he let out a giggle. Oh. You are teasing me. Joey is constantly reminding me not to take myself so seriously. Joey and I have developed a pattern. I prompt him to use the system, he ignores my prompt. Then he uses the system to ask me to GET the toy he dropped on the floor, to READ the book in my hand, or to tell me to STOP talking to his mom. Just as long as I don’t say “Tell me Joey…” I still prompt him, and sometimes he responds. Our current drawbacks are that the use of the system requires Joey to be in his chair, upright, and at a table sturdy enough to handle the screen. Once Joey is older the screen can be hooked to his chair, but for now it needs to be on a table so that it does not make the chair fall over. This means Joey only has language when he is sitting at a table. Sitting at a table is not usually the best way to teach a three year old, and it is not usually when three year olds need their language. Despite these drawbacks, the eye gaze system is giving Joey access to language. He can now tell me to stop talking to his mom and play with him through words instead of simply crying. He can tell us if he wants us to read or play with him. He can tell us which toy animal he wants to hold. Now that Joey can use the eye gaze to tell me what he wants, he can save his smiles and giggles for when he really wants to just smile and giggle. We can play silly “You got my finger!” games, and he can laugh and laugh freely, without worrying about mixing his silly laugh with his “I want that” laugh. As time goes on I hope Joey will use the system more and more. While he learns, it is up to us adults to figure out the best way to teach and encourage Joey to use the system. I am pretty sure if we step back and listen to Joey we’ll find our way.